Selby come away from Dinnington with only a losing bonus point when they probably deserved a 5 points win. Selby failed to build on last week’s home victory going down by a single point away at Dinnington; and while they will have some comfort at gaining a losing bonus point, they will be very disappointed that they did not register the full five points for a win. And, despite having some mitigating excuses (see later), they will really only have themselves to blame for that. 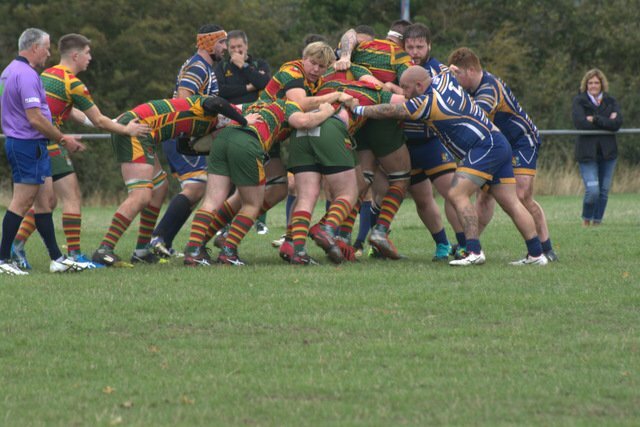 Dinnington are yet another hefty bunch, not just in the pack but in the backs too, and it took a while to realise that the two props idling about in the centres weren’t props at all, but actually were their centres! So it was no surprise that they started as they meant to go on, playing a very simple game of driving it in ad infinitum and things looked ominous as they camped on Selby’s line early on. However, Selby’s defence this season is a much meaner creature than of late and some crunching tackles from the pack, with skipper Charlie Cicero leading the way, repulsed the heavy mob before the first of many thumping runs from No 8 Liam Hogan cleared the lines completely. Selby then showed a little more finesse in attack as both backs and forwards found gaps wide out and up the middle. However, despite Selby’s superior cutting edge, their inability to deliver the coup de grace became apparent as great breaks by centre Alex Webster and prop Duncan Hardy went begging as the Swans failed to capitalise on them. Similarly, a couple of surging bursts from flanker Tom Edwards split the Dinnington defence with ease, leading to another gilt edged chance wide out - but the final pass was a shocker and the chance was gone. Finally, to the relief of the travelling Selbyites, another bruising run from Hogan set Webster away again to link up with new boy Andy Gorman and George Stoker, before winger Ash Dallimore was released to race away to score a superb team try for a 0-5 lead. It was hoped that Selby would continue in the same vein but, unfortunately, their ‘error compounded by penalty’ propensity then returned allowing Dinnington an easy passage to the Selby line, where forward pressure finally paid off as they crossed for a levelling score. Things then turned farcical as a chance for Selby to retake the lead with a penalty of their own was stymied by the lack of a kicking tee, and then the half was up. With the advantage of the slope and breeze in the second half, not to mention Dinnington’s relative lack of mobility, it might have seemed a good idea for Selby to kick deep to maximise their apparently superior attack where it mattered most? In fact, Selby barely got out of their own halve at all as a series of unforced errors gifted Dinnington good field positions; and they then induced that familiar Selby sinking feeling that this was not to be a Swans day when, following yet another Selby fumble, a sparkling back move of their own sent the winger in for a 10-5 lead after 50 minutes. Back came Selby though as a Hogan turnover was deftly transferred to Webster who again showed what could have been as he sliced open the Dinnington backline to race in from half way to regain the lead 10-12. Dinnington then couldn’t believe their luck as Selby again, despite numerous opportunities, failed to clear their lines from the kick off and after yet another unforced fumble in their own 22, Dinnington eventually took advantage of some uncharacteristic, very flimsy tackling to cross again for a 17-12 lead. Then back came Selby again as Hogan capped a fantastic man of the match display by simply shrugging off several would be tacklers to power over from distance to regain the lead, 17-19. But, yet again, another Selby unforced error, followed by the inevitable penalty, gifted Dinnington the lead again at 20-19. With only two minutes remaining Selby’s chance looked to have gone but they somehow seemed to have won it at the death as, following a miscued Webster penalty attempt, Dinnington produced what appeared to be their own terminal error by fumbling the ball right on their own line - allowing Selby’s Edwards to simply pick it up and dot it down for what those in the vicinity considered would be the simplest of match winning tries. Alas though, Mr Referee wasn’t in the same post code and was “unsighted”, so awarded Selby only the knock on, which he did see! Selby still had chances to kill the game off but firstly, despite having the dominant scrum, they butchered the five yard scrum chance before unbelievably another last kick Selby penalty chance (maybe awarded to try to amend a previous decision?) slid wide to bring the comedy of errors to a close. Selby now have a tough fixture at home on Saturday against the new league leaders Old Crossleyans, who demolished previous favourites Middlesbrough at the weekend, and they will need to take their chances better and cut down on the error count if they are to take anything from the match.